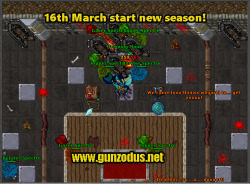 Real MAP EU Gunzodus 10/12.00 real map server tested for a years of work! Higher Rates hunts for 400~500+levels such as Dream Labyrint, Secret Library, menacing carnivors and many many more! iOS and Android chat app! What can you find on Gunzodus ? - Summer Update 2018 Update places like Asura Expanded areas, Falcon Castle, Darashia Elite Dungeon, MOTA expanded areas, Deathlings Grounds. - Prey System one of our latest feature, you can right-click your (or use the hotkey Ctrl + Y) and choose "prey system" from a context menu. - Imbuing System is the action of temporarily boosting an unequipment item. Different imbuements are available, they can be: physical damage converted to elemental damage, elemental protection, Skillboosts , Critical hit, Hit points leech, and Mana leech. Currently, imbuements are available for certain items more info can be found on any tibia fun page. - All AI bosses- Offline training, regular trainers with refilling stamina twice as fast, market in-game so you can sell your items more quickly and more effectively- All new places like Oramond,Roshamuul.Halls of Hope (10+ client updates), Gaz'haragoth and Omrafir spawn introduced, Otherworld, Krailos. - Latest outfits & mounts! We also have 12 client in beta version so everyone can test it but and we have an idea about 12 client players may have 10% boosted experience. 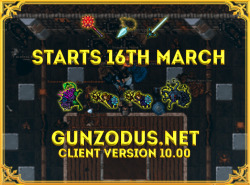 See ya on new fresh start of the one of most complete 10+/12 RL tibia servers ever! Izcandar the Banished has been released today, new elemental swords called Winterblade and Summerblade have been released too. Izcandar~ is located at Dream Labyrinth and can be repeated once every ten hours per character. Very good server, extremely recommended. orsha gunzodus was better :/ make it great again! Showing new features and latest updates soon on our stream! As the previous promocodes have been used so fast we release new one for new players! Still unused promocodes for Otland Players! 1 day left starting soon!!! 6 Hours, 49 Minutes left! Maybe more codes? Thanks in advance! damm all the codes used hahahaha you multi posting the codes on all social medias? We want to thank you for a great start to each our player with an ending number over 800 players logged in! Due to unexpected downtime during the night we are enabling 20% experience bonus for the next 24 hours. NPC Yana now trades only destruction weapons as it is supposed to be for 50 gold tokens. All those weapons can be imbued with critical hit imbuement either wand and rod. The possibility of party exp sharing on different floors is now removed as it was not supposed to be following the global settings. But our server is still raising come and join the biggest community of today's otserver world!